Snow Lion as depicted in the Emblem of Tibet. The Snow Lion, sometimes also Snowlion (Tibetan: གངས་སེང་གེ་, Wylie: gangs seng ge; Chinese: 瑞獅; pinyin: ruìshī), is a celestial animal of Tibet. It is the emblem of Tibet, representing the snowy mountain ranges and glaciers of Tibet, and may also symbolize power and strength, and fearlessness and joy, east and the earth element. It is one of the Four Dignities. It ranges over the mountains, and is commonly pictured as being white with a turquoise mane. From 1909 until 1959, a single snow lion or a pair of them was used as the national emblem of Tibet on coins, postage stamps, banknotes and the national flag of Tibet. The version shown on right with two Snow Lions was introduced by the 13th Dalai Lama in 1912 based on old military banners, and is still used by the Government of Tibet in Exile. The flag is popular known as the Snow Lion Flag (gangs seng dar cha). Snow lion is frequently mentioned in Tibetan folk songs and proverbs. It is thought to live in the highest mountains as it is the "king of beasts" that would tower over other animals of the lower levels. Snow lions may also represent hermits and yogis who live high up in the mountains. Marpa was called to interpret the meaning when, "Tibet's great yogin, Milarepa, once had a prophetic dream which included a snow lion." Legend has it that the lioness produces milk from its paws, and the milk may pass into hollow balls given to the lioness to play with. This ball may be represented in Tibetan art as a three-coloured "wheel of joy" (dga' 'khyil). A form of lion dance found in the Tibetan areas is called the snow lion dance or Senggeh Garcham. The name seng ge and its related forms come from Sanskrit siṅha, and cham or garcham is a Buddhist ritual dance. 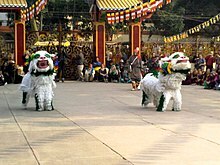 The snow lion dance may be performed as a secular dance, or as a ritual dance performed by bon po monks. This dance may also be found among people in other Himalayan regions such as the Monpa people in Arunachal Pradesh, and in Sikkim where it is called Singhi Chham. The lion was adopted as a symbol of Shakyamuni Buddha in early Buddhism; it is also depicted as a vehicle for a number of Vajrayana deities such as Vaishravana and Manjushri, and the lion throne may be found in many nirmanakaya Buddha forms. 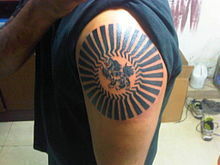 The lion in India art is represented in Tibetan Buddhist art as the Snow Lion. The Snow Lion is the protector of Buddha and in paintings and sculpture is usually seen as holding up the Buddha's throne (one on the left and one on the right of the throne.) The throne of a Buddha may also be depicted with eight Snow Lions representing the 8 main Bodhisattvas of Buddha Shakyamuni. The body of the Snow Lion is white while its flowing hair of mane, tail and curls on legs, is either blue or green. While most Snow Lions are gender neutral in Buddhist art there are some that are represented as obviously male and some as obviously female. When represented as a symmetrical pair the male is on the left and the female on the right. Sculptural Snow Lions are often in repousse metal that has been gilt and painted. The Snow Lion is a tulku or personification of the primordial playfulness of ananda "joy, bliss" (Wylie: dga'), comparable to the western unicorn. Though paradoxical, the Snow Lion does not fly but their feet never touch the ground; their existence is a playful continuum (Wylie: rgyud) of leaping from mountain peak to mountain peak. The energetic potency (wisdom or shakti) of the Snow Lion is expressed in the attribute of the gankyil or "ananda-wheel" the Snow Lion keep in eternal play. The gankyil is the principal polyvalent symbol and teaching tool of all the doctrinal trinities of Dzogchen and is the energetic signature of the trikaya. The gankyil is the inner wheel of the Dharmacakra of the Ashtamangala path of Vajrayana Buddhism. The Lhasa Apso is also called the Tibetan Lion Dog due to its resemblance to the Snow Lion. However it is unknown whether the dog was bred to resemble the Snow Lion or if the artistic design was influenced by the features of the dog. ^ "Legend of the SnowLion". Snow Lion Tour. ^ "Tibetan Buddhist Symbols". A view on Buddhism. ^ a b Rudy Harderwijk. "The Four Dignities". Symbols of Tibetan Buddhism. A View on Buddhism. Archived from the original on October 13, 2004. Retrieved 2007-01-19. ^ Lama Jabb (10 June 2015). Oral and Literary Continuities in Modern Tibetan Literature: The Inescapable Nation. Lexington Books. p. 35. ISBN 9781498503341. ^ a b Robert Béer (1999). The encyclopedia of Tibetan symbols and motifs. Serindia. p. 80. ^ a b Robert Beer (10 September 2003). "The encyclopedia of Tibetan Buddhist symbols and motifs". Serindia. pp. 63–64. ISBN 978-1932476033. ^ "Tibetan Snow Lion Dance". Tibet Views. ^ "Tawang Festival". India Travel. Archived from the original on 2013-01-25. ^ Shobhna Gupta (2007). Dances of India. Har-Anand. p. 76. ISBN 978-8124108666. ^ J. R. Subba (2008). History, Culture and Customs of Sikkim. Gyan Books Pvt. Ltd. p. 193. ISBN 9788121209649. Wikimedia Commons has media related to Snow Lion. Tibetan Government in Exile webpage for what they call the "Tibetan National Flag"